A spectacular vacation destination encompassing the world’s two most amazing theme parks side by side, a brand new water park, exciting entertainment complexes, and magnificent on-site hotels. Universal Studios is the first of the 2 Universal theme parks in Orlando. Immerse yourself in a real-life film and TV production facility. You can meet your favorite characters and ride thrilling attractions with cutting edge technology that is not found anywhere else. Transformers, Simpsons, Despicable me and Men In Black are just some of the popular move themed attractions in this park. Coming in the summer of 2014 the Universal Studios Florida Park will open Diagon Alley, an expansion of the Wizarding World of Harry Potter. If you purchase a park hopper pass, you will be able to ride aboard the Hogwarts Express between Hogsmeade and Diagon Alley. Universal’s Islands of Adventure is the second them park in Universal Orlando. This theme park includes the popular Hogsmeade from the Wizarding World of Harry Potter. Not a detail has been overlooked from the popular J.K. Rowling book series and you will feel that you have just opened a book and stepped inside of the pages. If you book a Universal Vacation Package, you will be allowed inside this theme park an hour before the general public. Although Hogsmeade is a popular part of the park other areas are not to be overlooked. You can meet a dinosaur in person and shake hands with a superhero. This park has some of the most epic coasters while still offering fun for little ones at Suess Landing. The two parks are connected by Universal CityWalk. This area comes to life at night with dining and shopping that you won’t find anywhere else. You can grab a bite at popular snack spots, like VooDoo Doughnuts or a meal at one of many populat easteries such as Hard Rock Cafe, Toothsome Chololate Factory, Cowfish and more. If you are in the mood to eat on the run, places like Burger King and Moe’s Southwest Grill are right there for you. In the mood for a little light entertainment? Play a round of mini-golf or enjoy a movie at the AMC theater. Whatever you enjoy, there is something for everyone on Universal’s CityWalk. Universal’s Volcano Bay Water Park This brand new park offers thrilling attractions at a convient location. If you are a guest at Cabana Bay Beach Resort, you will have your own private entrance into this park. The TapuTapu bracelet is your ticket to fun when you download the Universal Parks app. Link your TapuTapu to the app so that you can use it to pay for food & merchandise throughout the park. Skip the lines… Simply tape your bracelet on the symbol by the attraction and you will be checked in to the virtual line and given a return time, the TapuTapu will tell you when it’s time to ride. Just don’t forget to return your bracelet when you exit the park. Plan a visit to this water park and you will have a splashtacular time. Universal Orlando offers a wide range of choices in hotels for people wanting to book packages. There are special perks for the people that stay in a Universal Hotel; one of my favorites is the Express Pass that allows you unlimited access to an exclusive express pass attraction line at select attractions. (Express Pass available only for Deluxe on-site hotel guests). In addition, you can walk or take a water taxi from any of the Universal hotels to CityWalk and the theme parks and get priority seating at select restaurants. Universal offers 3 deluxe hotels, 1 moderate hotel & 2 value hotels to choose from. More value hotels are currently under construction. The Universal Partner hotels in the area expand your options and will still receive some of the great perks with your vacation package. Do you need someone to help you choose your hotel, find the perfect ticket & give you a little insider knowledge? As a Universal Parks & Resorts Specialist, an annual passholder & someone who spends countless hours in the parks, I’m here to help you plan at no added cost to you. 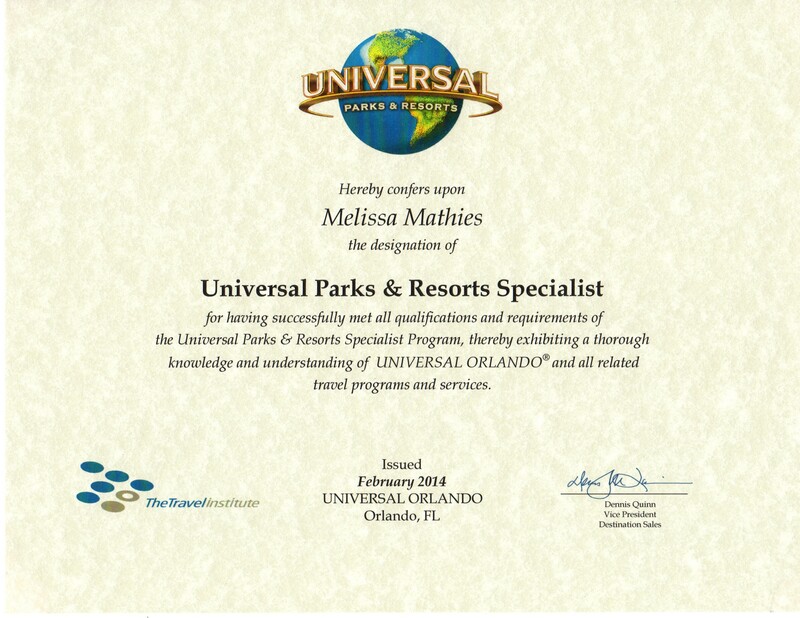 Contact me to book your next Universal Orlando vacation. It all starts with a free quote.